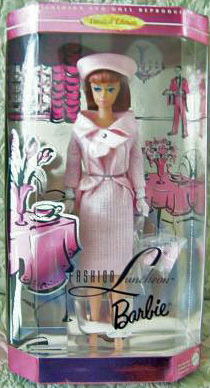 This is a reproduction of a redhead American Girl Barbie Dollwearing a reissue of the vintage ensemble Fashion Luncheon #1656 (1966-1967). This doll and ensemble reflect the influence that Jackie Kennedy had on fashion in the mid-1960s. The true vintage version of this doll and ensemble are very rare and quite expensive. This has always been very popular with collectors and is one of the harder to find reproductions. I anticipate it will become harder and harder to find these, as many are de-boxed to use the doll to display vintage fashions.